A cataract is a clouding of the lens of the eye caused by the buildup of proteins that clump together and distort the patient's visual field. For some patients, this condition can be very difficult because it can prevent them from participating in normal daily activities, such as reading or driving. A corrective procedure to remove the clouded lens and replace it with an intraocular lens (IOL) can restore a patient's visual acuity. In addition to improved visual clarity, there are many other benefits of cataract surgery performed by Dr. Sonny Goel at one of his Annapolis, MD, area locations. Namely, Dr. Goel performs bladeless cataract surgery that results in faster healing and minimized downtime. If you or a loved one is suffering from vision loss caused by the presence of cataracts, and you would like to learn more about the many benefits of corrective surgery, please contact one of our offices to make an appointment with Dr. Goel. Cataract surgery is traditionally performed using a blade to create two small incisions in the edges of the cornea, near the sclera (the white of the eye). Next, an ultrasound probe can gain access to the lens, breaking it into small pieces that are easily removed through gentle suction. When the lens has been removed, an IOL is inserted to restore clear vision. ​​​​​​​Although the traditional procedure is safe and effective, Dr. Goel prefers to perform laser-assisted cataract surgery because it has been shown to minimize patient discomfort and recovery time. Dr. Goel will create a digital 3D map of your eye that will act as a guide for the laser throughout your surgery and will aid in placing your IOL in the optimal position. The most apparent benefit of cataract surgery is clearer, sharper vision. There are different types of IOLs that you can choose from to meet your goals and needs. Traditional monofocal IOLs will provide you with clear vision at one distance, while multifocal IOLs provide focus at a range distances. Dr. Goel can help you determine which type of lens will best suit your needs. In addition to having your vision restored, cataract surgery can also increase your independence. Many cataract patients have had to rely on others to help them with their daily routines because they are not able to drive, or cannot see clearly enough to accomplish other tasks. 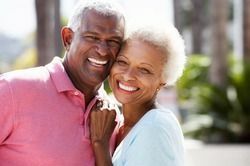 By restoring your vision with cataract surgery, you can regain your freedom and enjoy an enhanced quality of life. With laser cataract surgery, you can resume reading, driving, doing crossword puzzles, and other activities faster than you would after undergoing traditional cataract surgery. If you have cataracts in one or both eyes, and would like to restore your visual acuity in the safest, most efficient way possible, please contact one of our offices and schedule a consultation with Dr. Goel. Your first step towards sharp, clear vision is just a phone call away.